Only Dita Charanzova (ALDE) is not enthusiastic. I thought it would be helpful to provide a detailed update on the Firearms Directive. European laws on firearms have been in place since 1991. Certain weaknesses and failings of the existing Directive came to light in the aftermath of recent terrorist attacks. Last November the Commission proposed a revision, however the reforms were not balanced or workable for the legitimate gun holder. There was no majority in the Parliament committee to reject outright the Commission proposals. Therefore the Parliament has been going through an amendment process which I have been leading as rapporteur. There is now an agreement in principle on key elements. The Directive sets out the conditions under which private persons may lawfully acquire and possess guns or transfer them to another EU country. The Directive also sets requirements for marking and keeping and sharing of registers. Firearm types are defined as Category A,B or C. Category A firearms are prohibited except for certain types of individuals, Category B firearms need an “authorisation”, and owners of Category C firearms need to declare their ownership but do not need authorisation. live firearms. This type of firearm was used in Paris terrorist attacks. A cache of over 30 were discovered in the UK in 2015. The rules covering these firearms will now be tightened. Going forward any firearm which has been converted to fire blanks must remain licensed under the same rules as its original live-firing version. In order to strengthen deactivation regimes, the European Commission introduced a new Deactivation Regulation which came into force in April 2016. This sets a single standard for deactivation of firearms. However technical implementation issues have arisen and some countries are concerned that the new standard is less secure than their previous national regime. Following pressure from the Parliament, the European Commission has now re-convened a Working Group of Experts from the European Member States to review the Regulation. The Commission has committed that a revision will be completed by early 2017. Introduction of the Deac-Reg caused problems for legitimate holders of deactivated firearms such as historical re-enactors and those involved in film making etc, as it prohibits them from selling or transferring across borders any items deactivated prior to April 2016 unless the items are re-deactivated to the new standard, which is not technically possible in many cases. Following pressure from the Parliament there will now be a process to assess national standards in use prior to April 2016. If the standards are accepted by the Working Group and Commission as “equivalent” then items deactivated to that previous regime will be able to be bought, sold and transferred without requiring further modification. The Commission proposed that all deactivated firearms would become subject to the same registration and authorisation procedures as firearms. This was rejected. Instead the negotiations agreed that newly deactivated firearms should be categorised in Category C and need to be declared to national authorities while this would not apply to existing deactivated firearms. These were both rejected by the Parliament. There is experience that categorising items based on the subjectivity of “resemblance” creates legal uncertainty. The Parliament’s initial committee approach was that “Automatic firearms which have been converted into semi-automatic firearms” should remain in Category B if the conversion was irreversible and be in Category A only if the conversion was reversible. The Parliament proposed that the Commission should develop new technical standards to define which conversions were irreversible. However, the Commission was not prepared to accept responsibility for preparing technical specifications on these conversions. To reach agreement negotiators representing the majority of the Parliament conceded that automatic firearms converted into semi-automatic firearms should be Category A but added new authorisation procedures so that, at the discretion of the Member State, reservists, target shooters and others with special licences would be permitted to hold these. In addition a grandfathering clause is added so that existing owners can continue to own, transfer, inherit or sell these firearms to others who have appropriate authorisation. Again this is at the discretion of the Member State. Instead of using “resemblance” criteria both Parliament and Council proposed to add to Category A semi-automatic centre-fire firearms when a high-capacity loading device is fitted. Firearms have been categorised depending upon loading capacity already in the current Directive, and the new rules extend this approach. This only affects firearms which use centre-fire and not rimfire percussion ammunition. The categorisation applies when the firearm and magazine is in combination together, and does not depend merely on whether the firearms is capable of having a higher capacity magazine inserted. This has been made explicit in the text for adoption. Following lengthy negotiations, it was agreed that for long firearms exceeding 60 cm a magazine with a capacity greater than 10 rounds would be restricted, while for a short firearm the limit would be at 20 rounds. Member States will be able to give authorisations for reservists, target shooters and others with special licences for these firearms. As for those firearms that now fall under Category A6, there is a grandfathering clause. Law enforcement authorities in certain countries pressed hard for restrictions on higher capacity magazines. The Council approach was to prohibit their possession but this was rejected by the Parliament as it was considered impractical to enforce. Instead it was agreed that future acquisitions of loading devices will depend upon showing a valid and appropriate license, as is already the case for ammunition, so only those with authorisation to hold category A firearms will be permitted to acquire high capacity magazines. People who are found in possession of a high capacity magazine after a transition period and who do not have a category A authorisation will risk having their authorisation to hold firearms removed. Member states will be able to give Category A authorisations to recognised museums and in exceptional and duly reasoned cases to collectors, subject to strict security measures. The collection of ammunition is permitted. Member states will be able to give Category A authorisations to target shooters provided the individual is actively practising for or participating in shooting competitions. We have worked closely with the International Practical Shooting Confederation to ensure that the authorisation covers those entering the sport as well as those already competing. The current freedom of choice of equipment used by competitors in their shooting disciplines is not restricted. To facilitate continued participation in international competitions the rules governing the European Firearms Pass will be updated to cover firearms, including Category A firearms, held by such target shooters. Armed forces, the police and the public authorities are outside the scope. The provisions for authorisation for national defence also enables Member States to issue reservists with firearms. Language is introduced to cover the Swiss system based on general conscription which enables the transfer of military firearms to persons leaving the army. 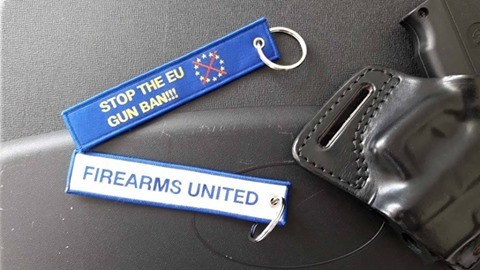 The European Firearms Pass enables legitimate owners to move firearms across borders. This has been updated to assist historical re-enators. Hand-loading and reloading of ammunition will remain permitted. Modifications of firearms for private use are also still permitted by private owners and not restricted only to dealers or brokers. The existing law states that authorisations are only permitted for those who “are not likely to be a danger to themselves or others”. The Commission suggested that medical tests should been needed for each authorisation and these should be reviewed every five years. However point-in-time medical tests are not necessarily effective. Instead it was agreed that each Member State must have a monitoring system to assess relevant medical and psychological information which they may operate on a continuous or non-continuous basis. Authorisation will be withdrawn if any of the conditions on which it was granted are no longer met, or may be renewed or prolonged if the conditions are still fulfilled. Member States can decide whether or not the assessment involves a prior medical or psychological test. This does not change national approaches or introduce new EU-wide requirements for medical testing. The current law requires firearms to be marked and registered so that each firearm can be linked to its owner. Law enforcement and Europol noted the risk of sales of parts. Going forward the essential components of a firearm also need to be marked and registered. To avoid risk of confusion the main identifier will be the mark affixed to the frame or receiver. The new marking requirements will not apply to existing firearms. Firearms of historical importance may not need markings depending on national law. To improve information sharing, dealers and brokers will need to inform national authorities of transfers through electronic means and Member States will share information on firearms held in their country. The provisional deal still needs to be confirmed by the EU member states’ permanent representatives (Coreper) and by Parliament’s Internal Market Committee. This is to happen towards the end of January 2017. The draft directive would then be put to a vote by the full Parliament in a plenary session in 2017 and formally approved by the EU Council of Ministers. It was proposed that Member States would have 15 months to transpose the new rules into national legislation and 30 months to introduce new systems for sharing of information. Members States may decide to suspend the requirement for declaring deactivated weapons and prior category D firearms for 30 months from the entry into force of the Directive. I would like to thank the many organisations who have assisted with technical advice including International Practical Shooting Confederation (IPSC), The European Federation of Associations for Hunting & Conservation (FACE), The Nordic Hunters’ Alliance, Federation of European Societies of Arms Collectors (FESAC), The Association of European Manufactures of Sporting Firearms, The British Association for Shooting and Conservation, Deactivated Weapons Association, Historical Breechloading Smallarms Association, The Royal Armouries, the Imperial War Museums and the Royal Museum of the Armed Forces and Military History. What about leisure shooters? 99% of people owning AR an,d AK are leisure shooters. Brilliant demonstration of european decadence. My opinion on the procedure is “playing silly buggers”. The only modification needed is the permanent deactivation of firearms. All European countries allow firearms only for sport shooting purposes (save the Czech Republic that allows also self defense). There is nothing playing against terrorism in these texts. Was not the Iraq war a constant terrorism? Was not the bombarding of Libya a terror act? Was not the bombarding of Serbia a terror act? Is not the bombarding of Syria a terror act? Is not the Afghanistan war a terror operation? Are not all these pompous and handsomely paid leaders war criminals? Are we not victims of the mafia-like NATO’s “selling of protection” ? We only need protection from the Commission and the political blood thirsty leaders that keep alive international conflicts, that keep sending armies and bombs, that tell us to collect the refugees they create. Both the proposal and the entire Commission shall be dismissed, or else, you cooperate to the establishment of a totalitarian state.